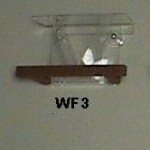 PRODUCT DESCRIPTION: The Window Feeder 3 measures 4 inches deep, 5 inches tall and 10 inches wide. It"s a good starter feeder. This Bird Feeder uses suction cups to hold it onto windows. The suction cups can also be purchased (item # 953181)below. This unique concept allows bird feeders to be placed where small rodents won't have access to all the seed yet birds will readily fly to it. The other great feature is that birds feeding are directly visible from the other side of the home so it is great for the whole family. With the use of these unique bird feeders you can get to watch birds up close and they won't scare. Birds will get used to having you very close to them within a week or two and as long as you don't make threatening motions or attempt to scare them in any way, just about any bird will become accustomed to people being close and not frighten.